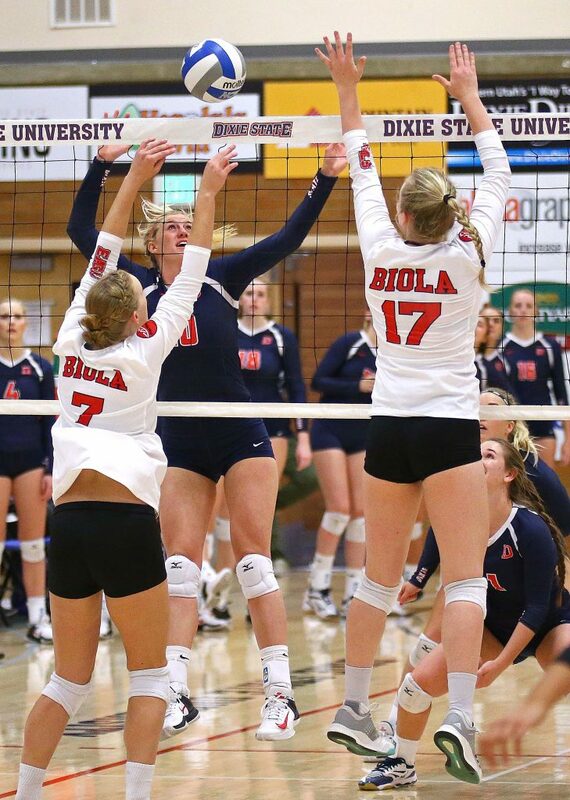 ST. GEORGE – Dixie State volleyball got its first look at PacWest newcomer Biola Saturday night. 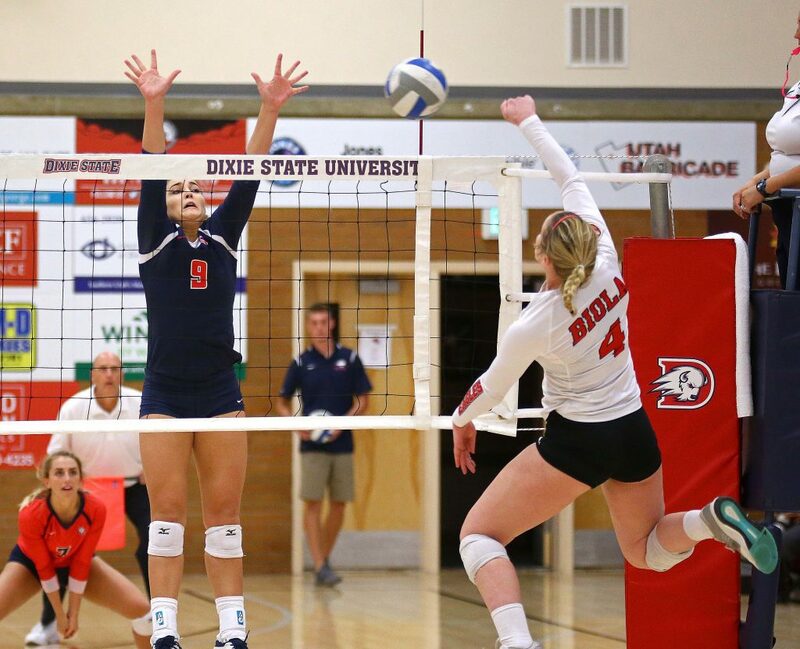 The Eagles came in and took Dixie State in straight sets. 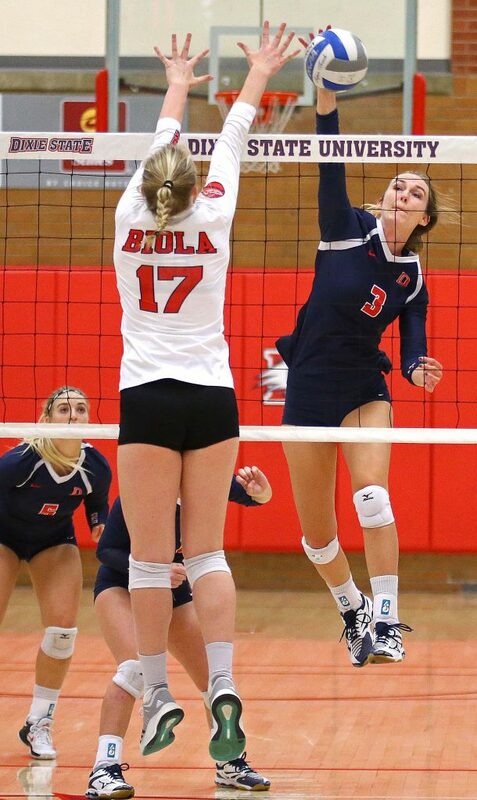 Biola has made a splash in the conference standings in its first year, sitting currently in third place behind Cal Baptist and Azusa Pacific. 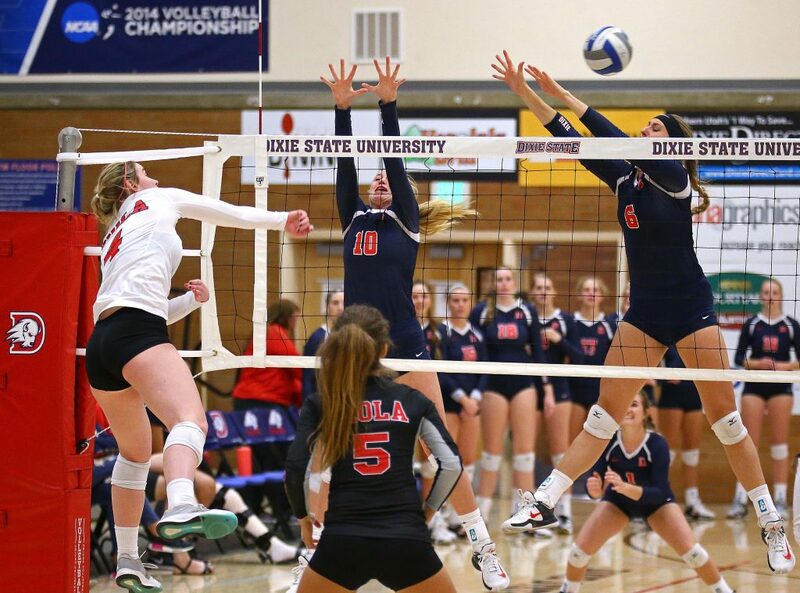 Dixie State went down early in the first set when the Eagles scored six straight to take a 10-5 lead. A collective block by Kayla Chapman and Shannon Sorenson ended the run. Later, behind Brandon’s service the Trailblazers went on a run of their own. Trailing 14-10, Lauren Gammell’s kill got DSU a side out. 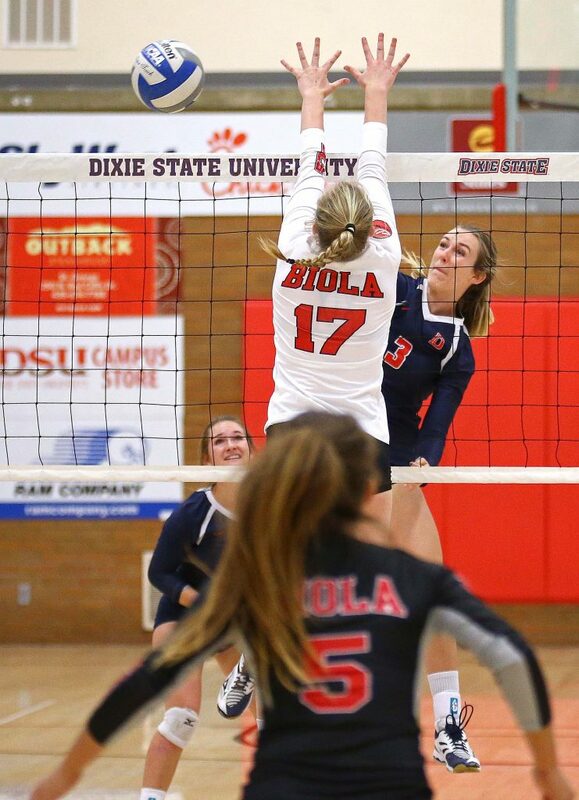 Successive kills by Gammell and Chapman followed by Biola attack errors put Dixie back in front, 16-14. The lead see-sawed and the teams were tied at 20 before Biola went on a final 5-2 run to close out the set. The second set saw the two teams stay close. They literally tied at every point from 12 to 21. 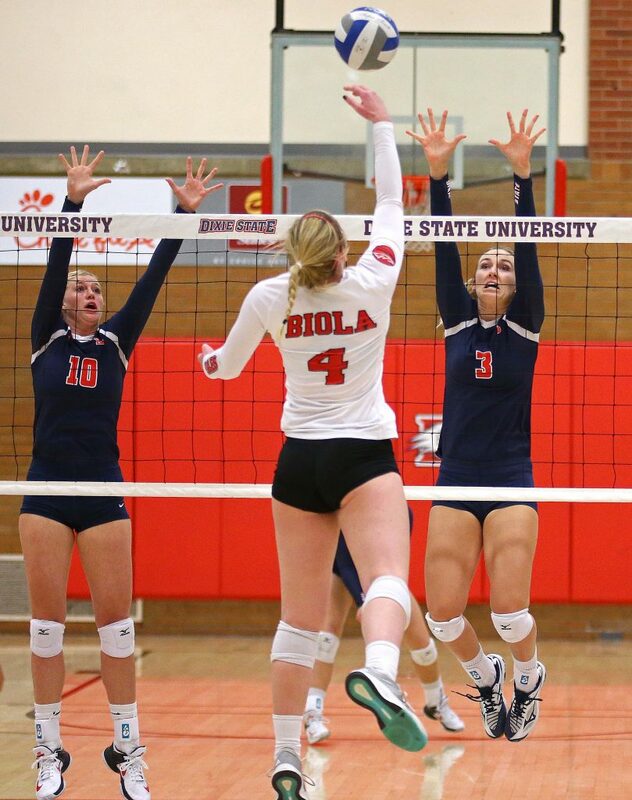 Then the bottom fell out and Biola scored the last four points of the set. In the third set, the teams again played even to 15. 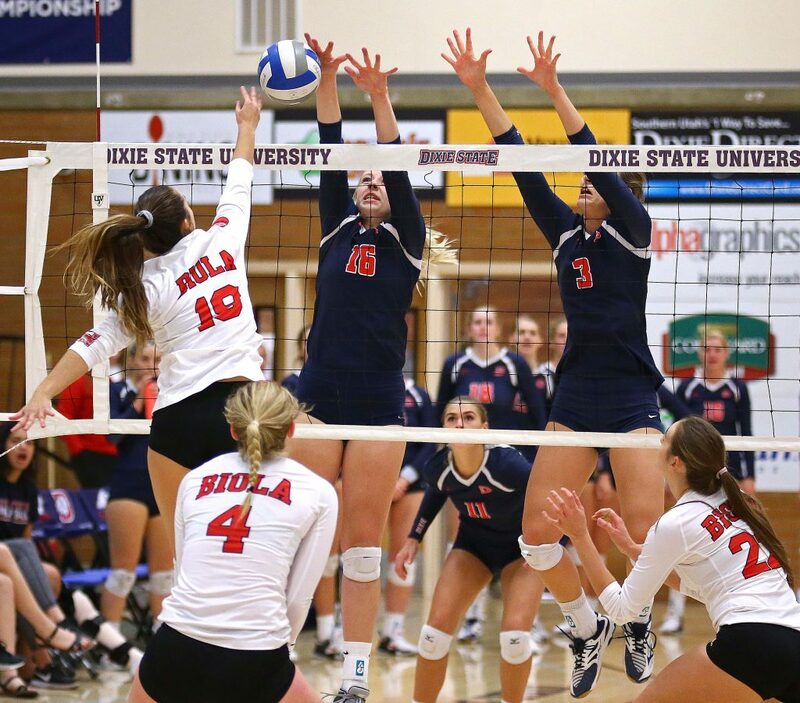 This time it was Dixie State who went on the late run. After a side out, again behind the service of Brandon, the Trailblazers went on a 5-0 run. 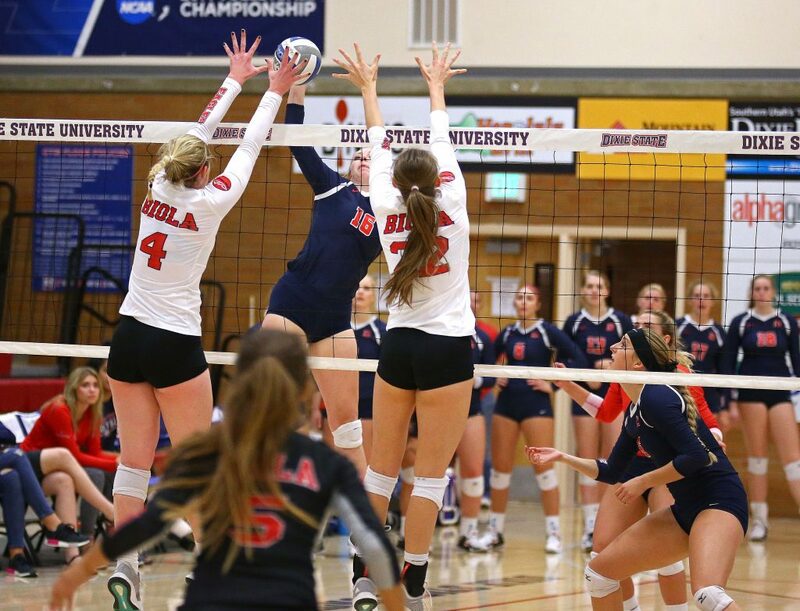 Hannah Doonan’s kill began the run and Biola had four separate errors end it. After a Biola timeout, however, the Eagles got back on track and were able to tie the score at 22-22. 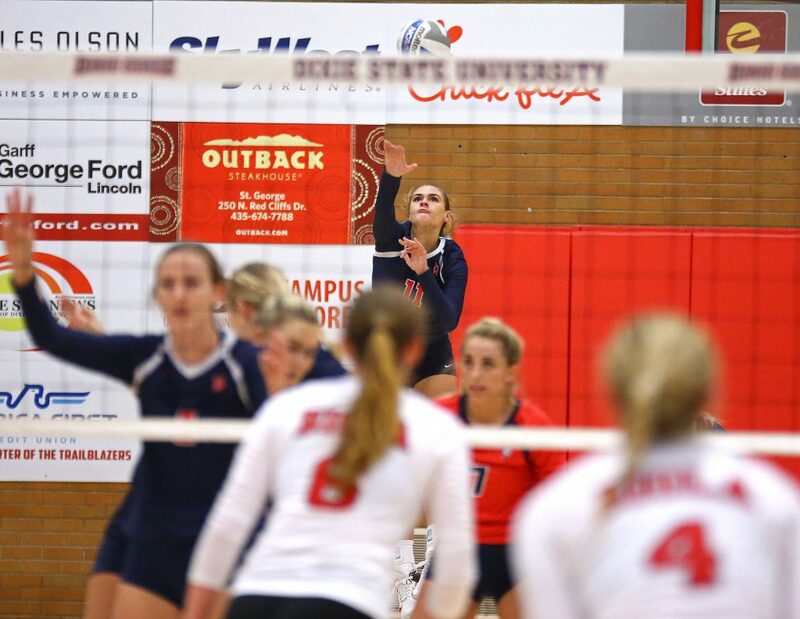 Dixie State’s last lead came on a Chapman kill at 23-22. 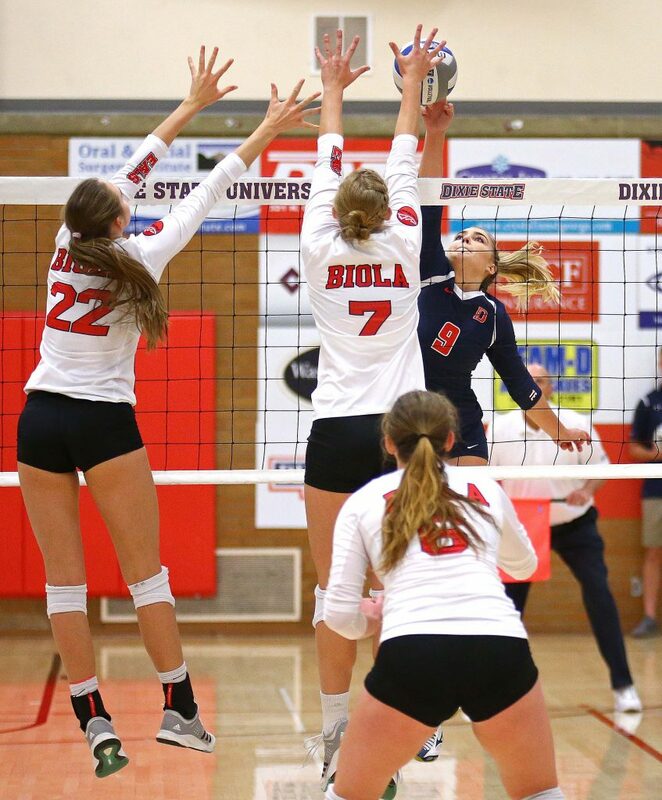 Then Biola closed out the match with the final three points. 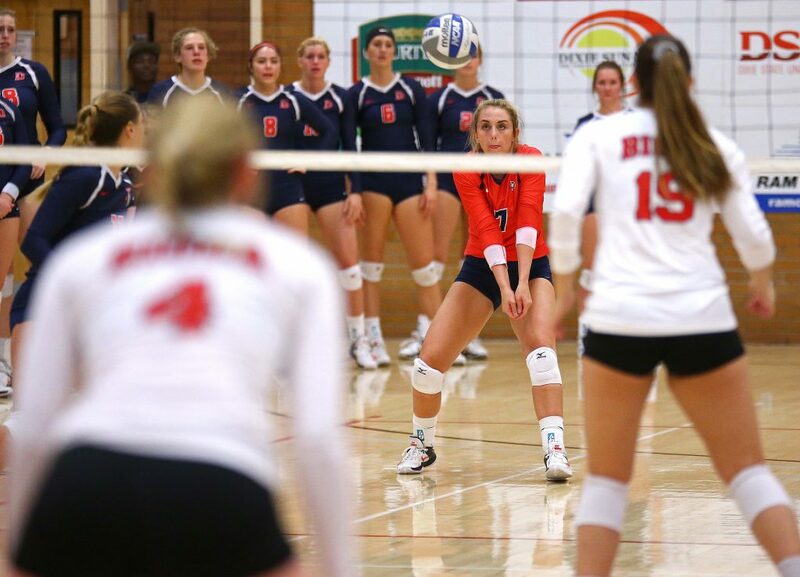 Dixie State had an attack percentage of .187 for the match with a high of .444 in the first set. The Eagles had a .250 attack percentage for the match. 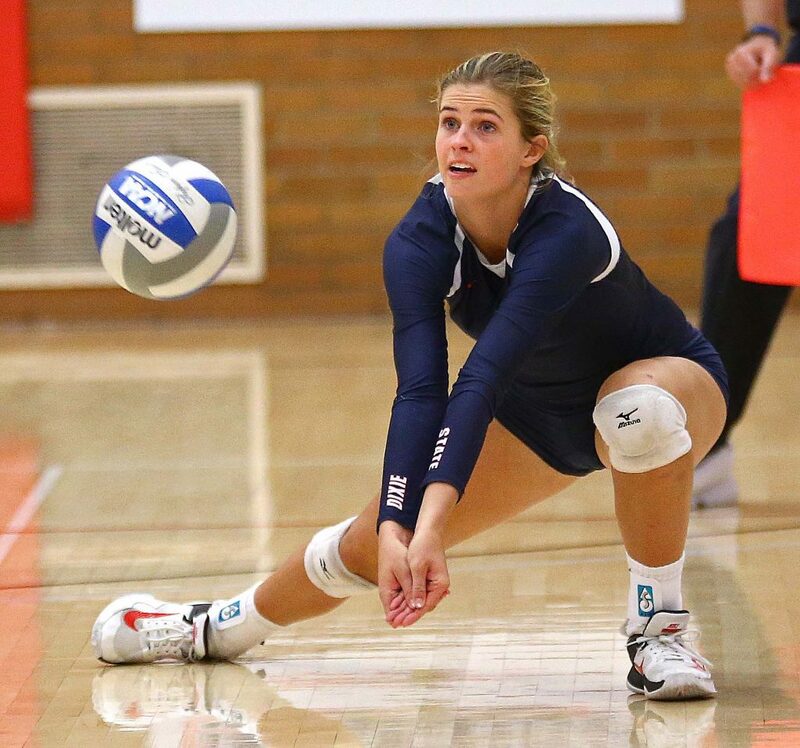 Individually for the Blazers Chapman led the team with 10 kills. Gammell and Donnan had seven kills apiece. Gammell also led the team with five blocks. Brandon led the team with nine digs. Jordyn Nelson and Kara Moore had 20 and 11 assists, respectively. 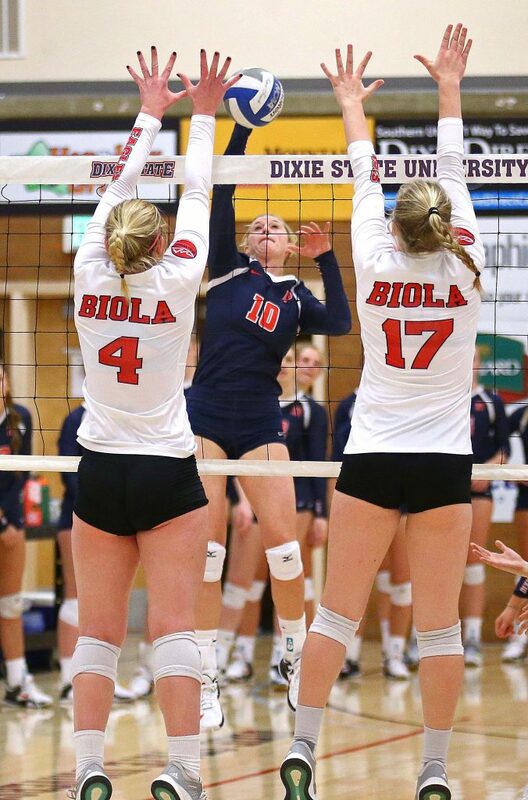 Biola improves to 15-6 overall and 9-4 in the PacWest. 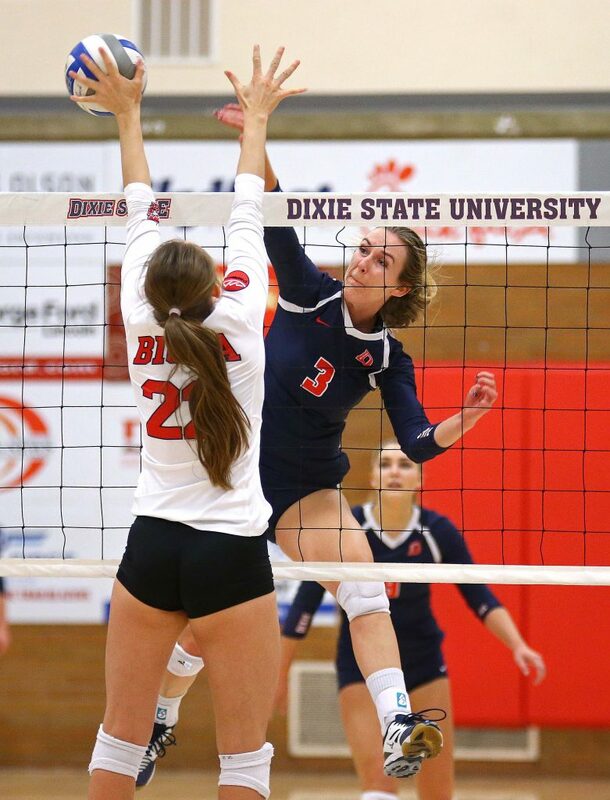 Dixie State falls to 9-12 overall and 7-6 in conference play. 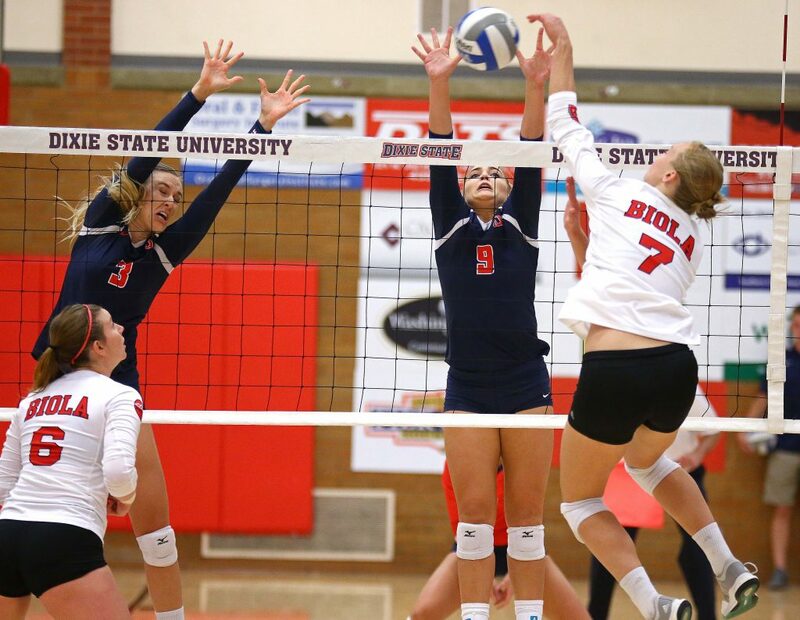 Dixie State is in the unfamiliar position of sixth in the PacWest. Senior Brette Barney was the only returning attacker with extended experience having been a part of the DSU rotation since her freshman year. 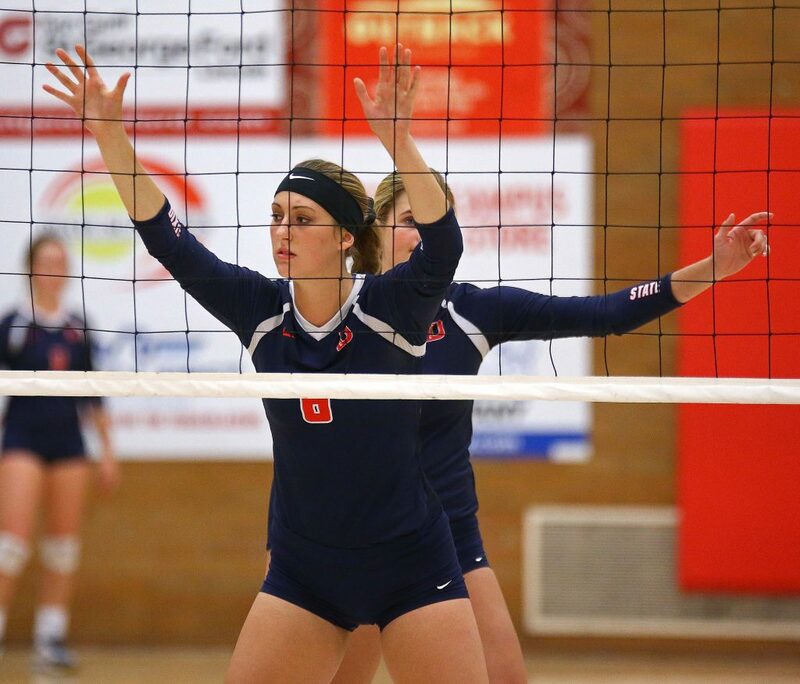 The Trailblazers will play their next two matches on the road beginning with a match against Cal Baptist this Friday at 7 p.m.
Who chose the uniforms for our Volleyball team to wear? That perverted old fossil Hue Hefner? Not that I’m complaining; but the cut of those shorts the ladies are wearing, is frankly just impossible to not see. Do these ladies really need to be wearing the social leftover ideals from the Dukes of Hazard decade? Catherine Bach would be appalled.